Last week the New Yorker magazine featured a controversial cartoon of the Obamas on their cover that they called The Politics of Fear. 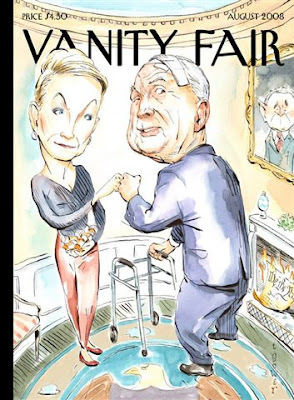 Vanity Fair magazine countered this week with a spoof of their own showing John McCain, using a walker, fist-bumping his wife Cindy holding RX drugs while the Constitution burns in the fireplace with a portrait of President Bush over the mantle. I don't even want to vote. I'll be honest...I don't like John McCain's character from some of the things I've read. His age doesn't bother me because he seems vital and healthy. I view age discrimination completely different than race discrimination. 1.) Aging hits us all. Whether we're old or young is just a matter of timing. Race and gender are different in my mind. 2.) There are real differences that occur to us all as we age. I don't think it's unreasonable to recognize that as we age we change. I'm 47. I will not be playing professional basketball in my lifetime. That's not discrimination. My body can't do what it used to do. I can't get a job as a model for Abercrombie & Fitch. That's not discrimination. No kid wants to buy clothes modeled by a middle-aged guy. McCain's age doesn't bother me, per se. I do however expect my President to be intellectually astute. My father is McCain's age and is very sharp. My mother is older than McCain and is very sharp. McCain however... Not really so sure. Some consider his health because of his "advanced" years. But, he's got good genetics on his side (his mother is still alive). That's not a big issue for me either. I really enjoy this Blog not only from the Christian perspective but I find your social commentary very helpful, thanks Kansas Bob. Thanks Brian, I concur with most of what you wrote.. but I am not sure that you see age discrimination as a valid issue. What of the older employees of a corporation that are laid off shortly before they are retirement eligible? What of a job candidate that is equally qualified but is passed over only because he is 47 and the othe candidate is 32 - after all, it stands to reason that the 32 year old may not have the health issues of the other ancient 47 year old.. so the younger is a safer bet.. and the company can alays ax him when he is 47 and more prone to health issues. The other issue I didn't bring up is the culture one.. I think that there is somewhat of a generational disrespect for older folks in our country.. even in chucrh circles everything is targeted to younger people. Bob, you brought up very valid issues about age discrimination. I didn't mean to say there aren't any issues, just that it is different than racial or gender discrimination in the two ways I pointed out. Thank G-d, I got out of the corporate world before they could start discriminating against me. G-d willing, I won't have to deal with that. I know that at my ripe old age of 47 I'd have a tough time going back if I wanted to. Very thought provoking post, Bob. I retired at 62 instead of waiting to 65. In my office at 62 I was the hardest working, most faithful employee..(20 Yrs) ..yet a young college gratuate came to the office and her starting wage was more that I made after 20 years...I said time for me to go home and bake cookies and love on grandchildren. Hard for a preacher to get a job at 70 too...glad my husband just retired. Age discrimination is a tricky topic, because while it is bad by and large, there are certain scenarios were it would seem prudent to me. For example, some companies play musical chairs with CEOs, but mine has never been that way. The next in line to be company president is a good 10-15 years younger than the retirement age president. I don't think it would have made good business sense to groom somebody the same age or older than the current president to take over. There are other people like that in upper management at my company, but they too have to worry about succession and grooming a replacement before they retire. Perhaps this isn't such a large concern for bigger companies with a larger labor pool, but for a small company like my own it was and is a very big deal. The presidency of the US is different, though. The position is short term by nature and only good for 4 years at a time, not 10-20 years. There is a plan for replacement in place at any time should health issues become a concern. Also, wisdom gained from experience would be very valuable in such a position. It seems to me that both younger generations and older generations tend to take each other for granted in the US. I think part of this stems from the anonymity of our elder support system in the US. Young people and their employers pay taxes totally 15.3% of each workers salary to support the elderly in this country, yet I've yet to hear a retired person thank a worker for paying those taxes, and the lack of connection with elders that our society promotes leaves young people with very little empathy for older folks. My grandmother recently moved to Sun City with the help of her two newly retired older children. There, they are actively working to greatly limit her contact with grandchildren and great grandchildren, considering them a burden and a bother. It is quite a contrast to my Filipino friends who took their grandmother into their home as she got older, where she interacts daily with their young children. When I lived in WA state, I used to visit a nursing home every week to read to and talk with folks there. It was really sad to see people whose children rarely, if ever, visited them. The disconnect of a life lived in a geriatric/youthful bubble is truly sad. Thanks for stopping by MB. An interesting perspective about the younger supporting the older with taxes.. from an older perspectiive I might say that I have invested 40 years of taxes into a system that younger folks now take for granted.. and many of us older generation folks have invested/supported in the younger generation as parents, teachers and in other ways. So, I think that many of us older folks may not see a need to say thanks when we are now required to work until 70 to reap the full rewards of retirement.. especially when we are still shouldering the lion's share of the tax burden in our country. Every generation has to support their children. That is the duty of parents and society, no matter how much some try to escape it. Also, just because "the great generation" wasn't grateful to the boomers and their children for paying for their retirement, doesn't justify the lack of gratitude by current or future retirees. Personally, I don't think young people take government retirement benefits for granted nearly as much as older people. Quite the contrary, most of the young people who have read even a little from unbiased sources about the situation don't believe those benefits will be there for themselves when they retire. The benefits are either going to be slashed to far less than current levels, or tax rates are going up astronomically, to the point of crippling the economy. The current benefit to tax ratio is unsustainable. Your scenario of feeling entitled to those benefits at the same level (or in most cases a greater level, albeit at a greater age) than one's parents received is relatively common. However, in my mind, the feeling of entitlement is often based on the false assumption that the money given to the government is invested for the future. Another common misconception is that the benefits should remain the same no matter how many children/grandchildren the average retiree has. That just isn't how SS and medicare are set up. They are essentially wealth transfer programs from the workers of today to the retirees of today. There is no investment of resources. The biggest problem with these assumptions is the false sense of security that arose based on the fertility rates of the first people to take advantage of these programs. The older generation could have the benefits they did without crippling the economy because they had a lot of kids and the ratio of workers to retired folks was very high (well over 5-1 for many decades). However, the baby boomers didn't have many kids. Coupling that with increases in life expectancies and the high cost of attaining those increased life expectancies has created an impossible scenario. This demographic shift is especially evident in Figure 3-3 of the CBO report linked to below. The congressional budget office estimates that government spending is scheduled to increase from 18% of GDP to 30% of GDP over the next 75 years. This is primarily due to the extreme costs of elder support as the proportion of working people to retired people drops dramatically due to the retirement of a generation of people who didn't have very many kids on average, yet expect their benefits to reflect the idea that they did have lots of kids. If the CBO reports are too obtuse, Ross Perot has put together some charts that pull this information together in a more succinct, understandable way. Great points MB.. I especially agreed with this one..
"They are essentially wealth transfer programs from the workers of today to the retirees of today." I might disagree that social security is an entitlment.. I would probably describe it more as an insurance program as it is similar to unemploymnet and disability insurance programs.. for years workers pay social security insurance premiums.. it is logical to expect to receive the benefits of the insurance when the policy terms are met.. hence it is not an entitlement of citizenship but of faithfully paying your premiums over your life. All that said I have to also say that social security would not be in the fix that it is if the government had run it more like an insurance company than a corporate slush fund. "hence it is not an entitlement of citizenship but of faithfully paying your premiums over your life. All that said I have to also say that social security would not be in the fix that it is if the government had run it more like an insurance company than a corporate slush fund." I'm not sure what you mean in the above statement. It seems like on one hand you are saying getting benefits from your kid's paycheck is to be expected if you paid for your parent's government funded retirement. However, later on you say that we wouldn't be in this fix if SS was run like an insurance company. The only type of insurance that would come close to matching the primary SS purpose of retirement income is whole life. For whole life, insurance companies invest the money you put in. They don't use it to pay today's retired beneficiaries of whole life benefits. If they did that, they wouldn't be able to pay benefits of retired whole life beneficiaries 30 years from now. In other words, one can't have it both ways. Either the money is invested to pay for one's future or the money is transferred without any investment to current retirees. While a dual purpose program is possible, it would cost far more than we pay now and the transition would be painful because today's workers would be paying for both their own retirement (at least partially) and all of the benefits of current retirees. Also, it is only logical to expect to receive promised government funded benefits if the program was designed in a sustainable manner. SS and Medicare were not designed in a sustainable manner, as the unbiased Congressional Budget Office report shows in dramatic fashion. Even if the government had never borrowed a nickel, those programs would still be totally unsustainable as currently designed. And, just a word of caution. The CBO reports assume that funds borrowed from SS and Medicare will be paid back when they calculate the dates at which those funds will be bankrupt. There are many who consider that a tenuous assumption. "I would probably describe it more as an insurance program as it is similar to unemploymnet and disability insurance programs.."
The problem that I see with this comparison is that proportionally very few potential workers need these benefits at any given time. If we had unemployment rates of 30%, then we wouldn't consider it reasonable that the government pay out generous unemployment benefits. As Figure 3-3 from the CBO Long Term Budget Outlook shows, the US is looking at a future where there are over 40 retirees for every 100 workering age people (including the unemployed). That works out to 28% of the working age and over population. Can you imagine the government indefinitely paying the healthcare and salary of the unemployed when the nation has a 28% unemployment rate? Most people would find such a proposition for unemployment benefits ludicrous on its face value, yet they see no such problem with SS/Medicare. The only way the government could afford to pay those benefits indefinitely would be to have planned ahead for massive, sustained 30% unemployment rates by investing trillions of dollars on a continual basis. It couldn't be sustained from current workers paychecks. The demographics and economics don't allow it. I think that I see where you are coming from MB.. good stuff. I guess.. using your thinking (well sort of) fire/police/highway departments and other government services would be considered entitlements doled out by the government.. maybe entitlement isn't the bad word that I think of it as.. maybe people who pay taxes are entitled to services.. maybe programs like social security are part of the contract the our governmental leaders have with the citizens of the country.. maybe they just need to be better managers of our tax dollars? Thanks for the polite tone of the discussion. I really appreciate that you and I can disagree and still respect each other as intelligent people with something to learn from each other. I don't think that fire/police/highway depts. etc. can be considered entitlements because there is a service provided in exchange for the pay of these people. The presumption of retirement benefits is that there will be no exchange of services for money. People are paid money because the government deems it valuable to support them. A more apt. comparison would be the government subsidizing the education of our young. Even this is not a perfect comparison though, because the government is trying to increase its own future tax collection through educating kids. While there is no direct exchange for services, it is still an important investment in the future. This is not to belittle the investment in our elderly, but simply a recognition of the self-serving economic benefit that is expected from investing in childrens' education. I hope I don't come across as if I think the government is fiscally responsible in how they have squandered excess social security taxes. However, I do think that one of the primary reasons that there has been no investment of these excess collections is that the anonymity of the current system makes siphoning a large amount off the top appear less like stealing than if the government decided to "borrow" money from individual retirement accounts which people felt belonged to themselves or others. Also, borrowing money isn't even close to stealing if one has a plausible plan for paying it back other than printing more money or raising taxes, which is never a zero sum game (e.g., inflation and the slowing of economic activity that accompanies tax increases). Speaking of fiscal responsibility. I think it would be a great idea if we could bring some to the social security/medicare programs by being willing to cut the benefits of the retirees proportionally to the fertility rate decreases of a given retired generation and the increased amount of time people spend retired on average, less increases in US economic productivity that increase the tax base. Since social security benefits are based on taking money from one's progeny to pay for one's retirement, a generation that has few kids shouldn't expect to receive the same benefits as past generations that had a lot of kids. They should also expect that if they start to live longer, the benefits should be cut proportionally as well in order to fund the higher number of retired people. The only other option is to raise taxes on the working to far more than the current retired generation paid, which is neither fair nor fiscally responsible as one cannot simply assume that this will work forever. However, the government just isn't fiscally responsible, so I don't expect proposals like this to fly. In 1950 there were about 16 workers for every one person receiving social security benefits. Today, that number is more like 3.3 workers. The number of retirees has increased by a nearly factor of five (4.8%). In that same time period, social security/medicare taxes have increased from 3% to 15.3%, more than a factor of five (5.1%). While the increased productivity of the country has helped fund an increase in the amount of benefits that retirees get, it doesn't take a brain surgeon to see that the primary driver of tax rates has thus far been the proportion of workers to retirees and that current workers can expect future social security and medicare tax rates to be about 25% in order to fund their parents' and grandparents' retirement, assuming that we can clamp down on health care inflation to the more reasonable numbers of the past and life expectancy doesn't go up much more and US economic productivity continues to increase as rapidly as it has in the past. Personally, I find more than one of those assumptions dubious, but if I'm wrong, I'd love to continue funding future retirees at the current benefit levels and current tax rates. Thanks for coming back MB. Not sure if I previously communicated very well but I was trying to say that our taxes fund the police department so it could be said that we are entitled to police protection because we pay taxes. The Social Security Administration of the United States actually oversees two separate funds that hold federal government debt obligations related to what are traditionally thought of as Social Security benefits. The larger of these funds is the Old-Age and Survivors Insurance (OASI) Trust Fund, which holds in trust those funds that the federal government intends to use to pay future benefits to retirees and their survivors. The second, smaller fund is the Disability Insurance (DI) Trust Fund, which holds in trust those funds that the federal government intends to use to pay benefits to those who are judged by the federal government to be disabled and incapable of productive work, as well as to their spouses and dependents. Notice the word insurance is used in the OASI. In that wiki it also says that in 2006 the accumulated surplus stood at just over $2 trillion and it also speaks to how the Greenspan commission secured the fund for the future and how it should be solvent until 2042. It seems to me that, in lieu of this, that SS is an insurance program and people who have paid their premiums should receive benefits from it. The government could call its contributions to education "education insurance." Just calling social security social security insurance doesn't make it so. The government would never allow a real insurance company to operate the way it has with social security, promising benefits that it can't deliver on and stealing money to fund other unrelated programs (and still not make up for the overall budget deficit). There are two problems with saying that SS will be solvent until 2042 or thereabouts. The most critical is that it considers social security as a completely separate problem from medicare. Bush just recently pushed through the medicare prescription drug benefit program. There is no way on God's green earth we could have funded medicare without that benefit, let alone with it. Are current retirees willing to see medicare benefits cut so that the balance of medicare and social security income through taxes equals their output in benefits? If so, then my problems with saying that social security is funded through 2042 are greatly lessened. If they could pass a law like that, I'd quit complaining about how current retirees are out to screw the younger generations. However, I'm still not completely comfortable with saying that. The reason for my reticence is that the government has been incredibly irresponsible in using social security tax dollars to fund other programs. The government changed the rules in the 70's to go with a unified budget considering "trust fund" dollars as part of all income. Soon after that, they began borrowing from that trust fund and considering it as normal income that didn't count toward the deficit in the final budget numbers. It was a shell game to make the budget deficit look smaller. Also, it was easier to raise those taxes than regular income taxes, since there was a perceived future benefit. It was great for politicians. They could claim to cut income taxes while at the same time raising payroll taxes and lessening the impact of income tax cuts on government services. Given that the overwhelming evidence says that the government raising excess SS taxes didn't increase national savings by anything close to what they have "borrowed," but instead went toward excessive government spending, I'm not convinced that those excess contributions should be considered anything other than increased taxes, meaning social security will be effectively bankrupt in the next decade. This must be hard for somebody of your age to hear. However, I look at it this way. The government screwed somebody in using excess contributions to make the deficit look smaller. Who will it be? The next generation has already been saddled with outrageous deficits that were used to fund excessive government services and tax cuts for current workers and had basically zero say in those decisions. Should they bear all the burden of the financial irresponsibility of past governments that were run by the generation soon to be seeking to extract those promised benefits? It hardly seems fair to make future generations pay for a current generations' mistakes and fraud. At the same time, not everybody soon to be retired was complicit in the government theft of what should have been savings by letting the @#$# politicians stay in office year after year, just most of them. Would you say that splitting the error for the government's fraud in half between retirees and taxpayers would be fair? Speaking for myself, I think it's more than fair. That said, if I could convince retirees to simply consider medicare and social security as a whole and not insist that future generations pay increased taxes to pay for SS and medicare benefits that they have known for decades couldn't be funded under the current system, I'd be happy. Honestly, I think boomer retirees will be the biggest voting block for decades in this country. If they can't re responsible enough to change the system to something sustainable now, I think they will completely ruin the economy before they give up one iota of their perceived due. Honestly, I don't know your age, though I assume you are nearing retirement or currently retired. Please, don't take my indictment of current retirees and boomers personally. 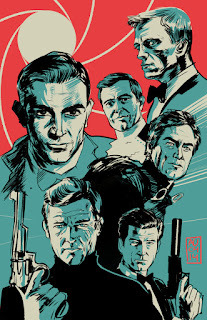 I have huge problems with how they acted as a whole, but that doesn't mean I think all of them are selfish bastards (nor does it mean I think my own generation is any less willing to screw their children if given the opportunity).